White ash is a medium to large tree with a straight, tall trunk and narrow, rounded or pyramidal crown. Leaves are opposite, feather-compound, 8–12 inches long, with 5–9 (usually 7) leaflets; leaflets broadest near the base or middle, 3–5 inches long, 1½–3 inches wide, margin often with rounded teeth, tip pointed, upper surface dark green, dull to somewhat shiny; lower surface paler, whitish, smooth; leaf stalk smooth. Bark is light gray to dark brown, grooves deep, with narrow, interlacing ridges that are flat-topped, forming diamond or X-shaped patterns. Twigs are stout, rigid, brittle, green to brown, or gray, smooth; pores pale; bud at tip about ¼ inch long. Flowers April–May, with male and female flowers in clusters on different trees. Male flowers small, green to red, with no petals; female flowers similar to male flowers. Fruit matures in August–September, in dense clusters up to 8 inches long; fruit is a samara, with the wing partially around the seed; yellowish-brown, 1–2 inches long, smooth, flat. 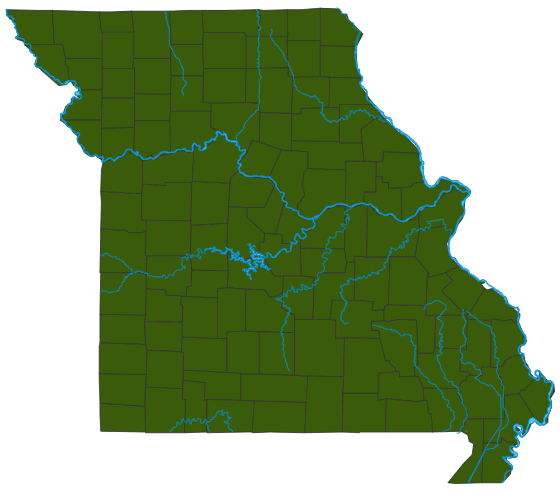 Similar species: Missouri has 6 native ash (Fraxinus) species. In addition to white ash, there is Biltmore ash (F. biltmoreana), green ash (F. pennsylvanica), pumpkin ash (F. profunda), blue ash (F. quadrangulata), and Sullivan's ash (F. smallii). Biltmore and Sullivan's ash have sometimes been considered subspecies of white ash. A Eurasian species, flowering or manna ash (F. ornus), is sometimes cultivated as a landscaping tree. All will likely be eradicated by the invasive emerald ash borer, a wood-boring beetle that kills ash trees before they can reproduce. Height: to 90 feet; spread: 60 feet. Occurs in mesic (medium moist) to less commonly dry upland forests, edges of glades, bottomland forests, banks of streams, rivers, and spring branches, margins of ponds, lakes, and sinkhole ponds, bases and ledges of bluffs, and loess hill prairies; also in pastures, roadsides, and disturbed areas. In nature, it tends to occur in somewhat drier locations than is typical for green ash. It is widely planted as an ornamental and as a shade tree. Male trees flower every year, but female trees flower and produce large amounts of seed every few years. Some botanists have noted that on occasion, individual white ash trees may switch gender, producing only pistillate flowers one year, or only staminate flowers the next; mixed flowers may also be produced. The seeds of white ash sprout prolifically in disturbed sites and unkempt yards. Often, white ash leaves turn color in autumn before the peak arrives in Missouri. The word “white” in the common name might refer to the pale undersurfaces of the leaves. One of the best trees in eastern North America: Popular in landscaping, glorious in the autumn, with excellent timber value (Louisville Slugger baseball bats are made from white ash). You might think twice before planting an ash tree, however, because sadly, the exotic emerald ash borer has arrived our state, and its presence means that nearly all ash trees will die. Widely planted in landscapes, a favorite tree for fall color (the leaves turn yellow or purple). An important timber tree: The wood is used for baseball bats, tool handles, musical instruments, cabinets, doors, frames, fuel, ships, and boats. Native Americans used tea made from the tree medicinally. The fruit is eaten by a variety of songbirds, bobwhite, wild turkey, wood ducks, and small mammals. Deer sometimes browse this species heavily. Ash is one of the trees famous for having a mutually beneficial relationship with morel mushrooms, whose underground fungal filaments share nutrients with the roots of the tree. Morel hunters know to focus on the ground under ash trees, locating the trees at a distance by the X-shaped patterns in the bark.